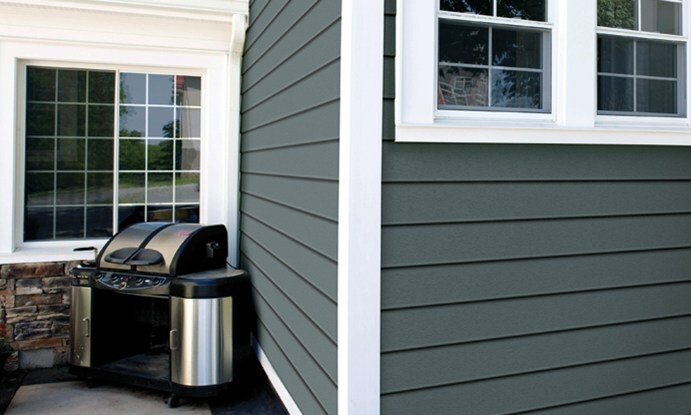 PVC Siding is an eco-friendly, cellular composite siding manufactured to mimic the look and feel of classic real wood siding without the expenses involved in maintenance. Its clever interlocking joints ensure it won't be penetrated by moisture; meaning warping and buckling will not occur and you can forget about mold, deterioration, re-painting and re-caulking altogether. To top it off besides being maintenance free, PVC siding is 100% recyclable and provides an R-value that is twice the thermal value of any other comparable material. Not only does this beautiful product add curb appeal that stands the test of time to your home, it saves you money! Referring to the technique typically used when installing wood boards in overlapping horizontal rows 4" PVC Clapboard is an innovative take on a style of siding that has been used for years. Wood siding was often considered a versatile choice as it could be painted or stained many different colours, with 15 different colour options to choice from the 4" PVC Clapboard is an ideal product for any homeowner. Similar to the 4" Clapboard, the 7" Clapboard offers the look and feel of a real wood siding with a defining wider profiler. Available in the same 15 colour options as the 4" Clapboard it's a beautiful option for home owners interested in adding a twist to the classic look of the 4" Clapboard. Used for centuries in French country homes the Board & Batten style has typically been used as a stunning way to add character to your homes gables. Offered in a variety of contrasting colours it gives the home a distinct and elegant look, demanding the unique beauty of your home be noticed. The Shake style is the perfect way to emulate the look of cedar shake siding while eliminating the time and costs involved with maintaining real wood. Used over the entire home or as an accent to the remaining aspects of the exterior it's an uncomplicated way to add a rustic yet sophisticated look to any home.